This slow cooker crack chicken recipe is so EASY! 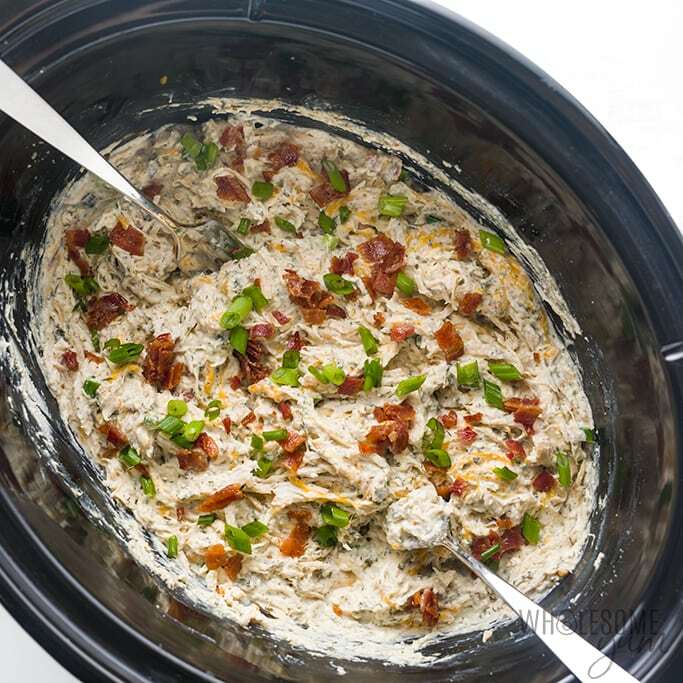 If you want to know how to make Crock Pot crack chicken, it takes just 10 minutes prep time. And, no one will know it happens to be keto crack chicken, too. 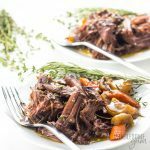 Cold weather always has me turning to low carb slow cooker recipes. 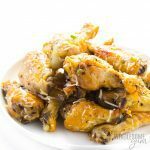 One of my favorites is Crock Pot crack chicken, because it’s so comforting and needs minimal hands-on time. Best of all, it uses ingredients many of us have on hand all the time. That was the perfect excuse to make this slow cooker crack chicken recipe again this week – and to share it with you! This keto crack chicken is one of those meals that will please almost anyone, even if they aren’t low carb, so it’s perfect to make for the family. Try it with me! I’ll bet you’ll be making it again and again, like I do. 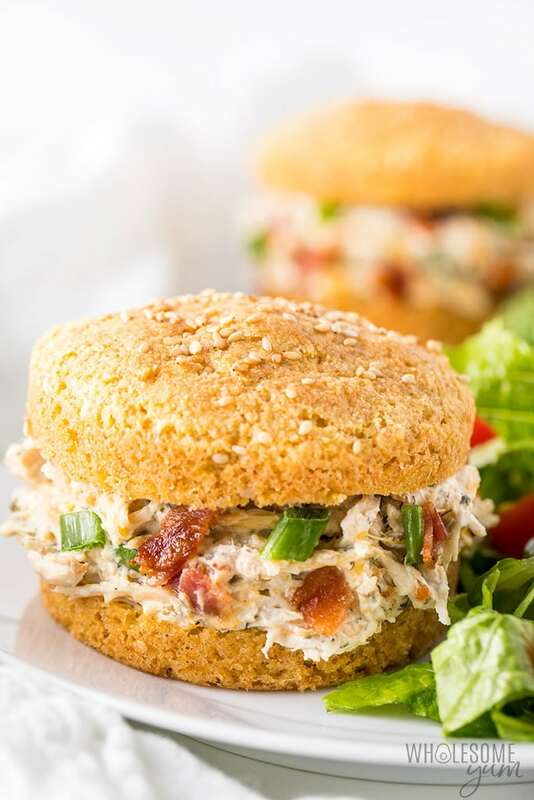 Crack chicken is basically a creamy shredded chicken made with cream cheese, ranch, bacon and cheddar. 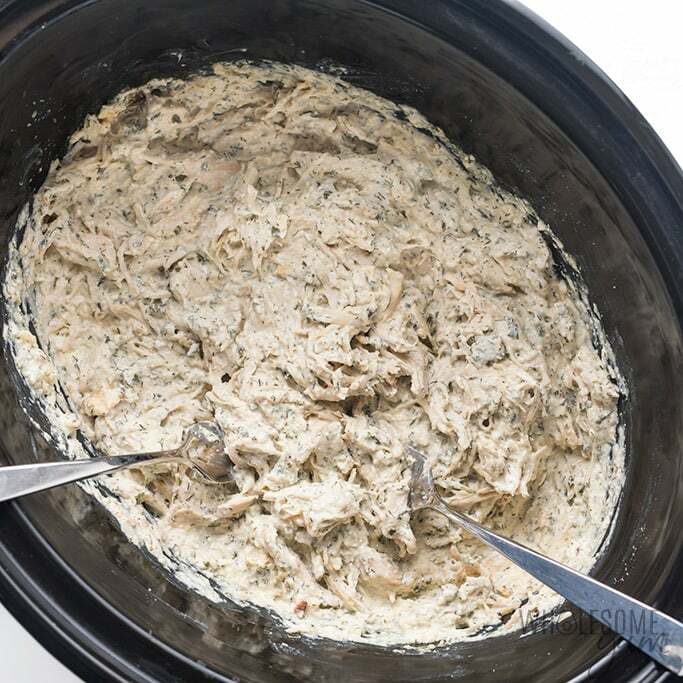 This easy crack chicken recipe is similar to crack dip, but we use ranch seasonings instead of ranch dressing. This creates a stronger ranch flavor without making the chicken too soupy. And of course, this has chicken as the main ingredient, unlike the dip. Many crack chicken recipes use ranch seasoning packets, but they are filled with all kinds of weird ingredients, starch, preservatives, and sometimes even sugar. There’s no reason to do this, because you can easily make your own crack chicken seasoning! It’s very similar to the seasonings I use for homemade ranch dressing. 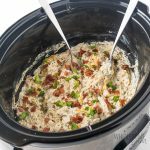 Yes, this slow cooker crack chicken recipe is keto friendly! All that cream cheese provides plenty of fat, and each serving has only 3 grams net carbs. But even if you aren’t keto, this chicken recipe is simply delicious – whether you’re on a special diet or not. How Many Calories in Crack Chicken? Crack chicken is low carb, but it’s not a low calorie food. Still, it’s not as caloric as you might expect from a dish made with cream cheese and bacon! Each 5.5 ounce serving has 214 calories. This isn’t many calories on its own, but it’s not a huge serving size, either. Keep in mind you’d usually serve crack chicken on something, such as buns or lettuce wraps. You also probably need a side dish. When you add that all up, it will be enough for a meal. Check my ideas for how to use and what to serve with crack chicken below! How Long To Cook Crack Chicken in the Crock Pot? The time to cook slow cooker crack chicken is about the same as any other shredded chicken recipe. That’s 3 to 4 hours on high, or 6 to 8 hours on low. Tip: The “sauce” might not be smooth when the low carb crack chicken is done. You might see some chunks of cream cheese that don’t look smooth. Don’t worry – it will all become smooth after you shred the chicken and STIR. Finally, stir in some crispy cooked bacon, shredded cheddar, and green onions. You can also reserve some for topping, if you’d like. Yes, you can freeze this slow cooker crack chicken recipe! To do so, let it cool to room temperature first. Then, place it into freezer bags, press to get rid of any extra air, and lay flat in the freezer. You can move it upright if you like after it’s solid. When you’re ready to serve your keto crack chicken, you can thaw and reheat it in the microwave or oven. 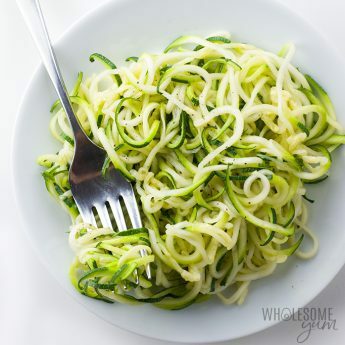 You can find more ideas for low carb side dishes here. Place the chicken breasts into the slow cooker in a single layer. Arrange the pieces of cream cheese evenly over the chicken. Cook the chicken for 3-4 hours on high or 6-8 hours on low, until the chicken is easy to shred. Shred the chicken and stir to mix with the cream cheese. Stir in the shredded cheddar, bacon bits, and green onions. Click or tap on the image below to play the video. It's the easiest way to learn how to make Crack Chicken in a Crock Pot! Is the chicken breast boneless and skinless? Anxious to try the recipe! I did the recipe and I put to cook for 6hrs on low and I lost all my ingredients because burned. I followed exactly as your directions. I don’t understand how your chicken don’t burn without some stock, water or broth. Hi Patricia, Sorry to hear that happened. It sounds like your Crock Pot runs hot, because at a low setting it should not burn. The chicken also releases liquid as it cooks. I’d double check to see if your slow cooker runs hot. Does the chicken need to be thawed before going in the crockpot? I’m excited to try this! Yes, thaw the chicken first. This prevents it from being at an unsafe temperature for too long. This was great – easy and tasty. Getting ready to make it again. I love this recipe! I served it with your microwave English muffin recipe for a sandwich and it was delicious. When I plug all the ingredients into the recipe nutrition calculator I get a fat content of 24g per serving, but the recipe says only 8g? 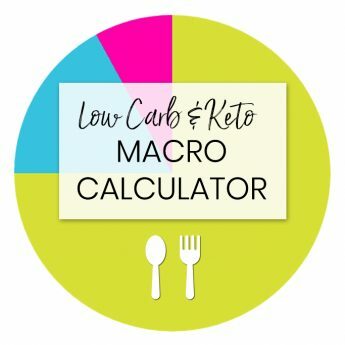 Do you have a favorite nutrition calculator that you prefer? Thank you for all your wonderful recipes. Hi Tracy, I’m so glad you liked the recipe! I get nutrition info from the USDA Food Database, which is most reliable. Holy cow this was amazing!! THANK YOU FOR THIS RECIPE!!! 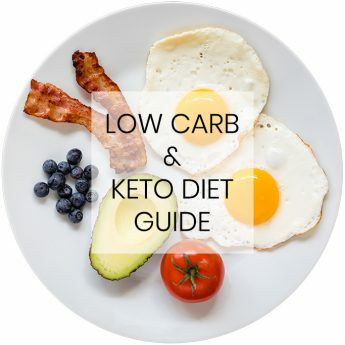 Fun recipe for my keto loving friends! And so EASY! Loved it! I love using my slow cooker all year long, and this is a delicious way to make chicken. I love how you can use this in so many different ways – it made such a great dip! 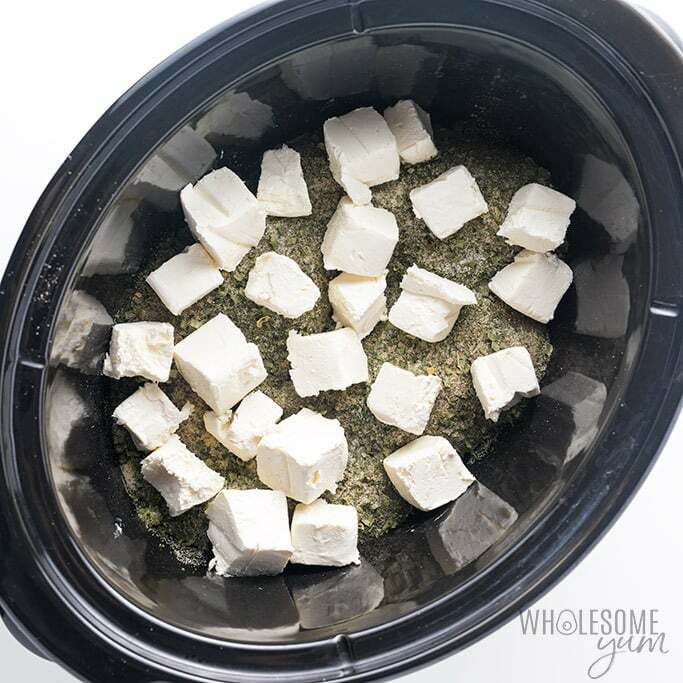 I have just got Instant Pot and I am sure this recipe will work as well there. Can not wait to make it next weekend. Thanks a lot. Yum! 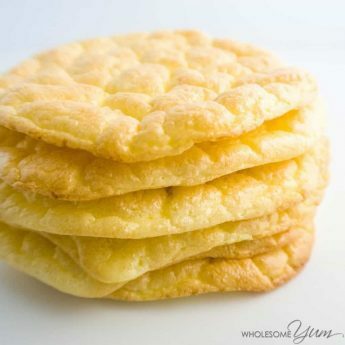 I love the idea of serving this inside keto rolls for sandwiches!! I can’t wait to try this recipe, going to wait for the bun recipe, it looks sooooo yummy! Wow, this looks amazing. And anything in the crockpot is so convenient. Love this idea! 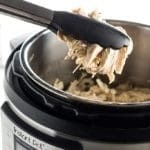 Could canned shredded chicken breast be used? Hi Lori, You probably could, but wouldn’t need the slow cooker then. You’d just warm the cream cheese with the spices and mix with the shredded chicken. It would be similar, but probably less flavor than actually cooking the chicken together with everything. So easy and so so good! 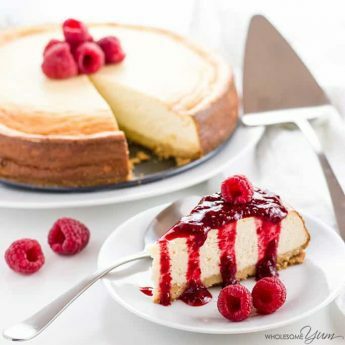 Great recipe thank you! 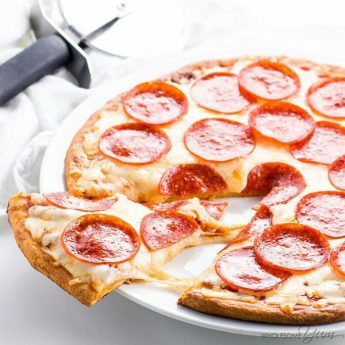 Love Love Love this recipe!!! can’t wait for the hamburger bun recipe! Hi Brittany, The serving size is in the recipe notes – it’s approximately 5 1/2 ounces, or 1/10 of entire recipe. Sure, you can skip the bacon altogether if you’d like, or use turkey bacon for other family members. I would like the recipe for your hamburger buns!!! Those look amazing!! Can the leftovers of this recipe be put in the freezer? Hi Jennifer, Yes, you can! I have a section covering this in the post above. This is a great recipe! One tip for shredding chicken, use your handmixer!! I used to do it by using 2 forks and hated it and wouldn’t do recipes that called for shredding chicken, until my hubby used the hand mixer! Now it takes seconds to do what used to take what felt like hours!! Now I’m doing all those shredded chicken recipes and loving them!! Hi Lisa, Thank you! Great tip on the hand mixer! This crack chicken is truly the BOMB! It’s filling and simply delish. Even tastes great cold. 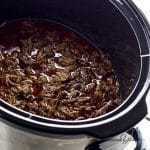 I made a two serving batch yesterday, and last night I made a full crock pot full of it. Is really great with bacon mixed in it and cheese on top. I will be eating this at least 4 times a month! I’m making my household a crack chicken Thursday, every though it may be a Tuesday or Saturday! It’s great every day! Thank so much. I’ll be trying other recipes too! Haha, I love the idea of crack chicken Thursday! So glad you liked this so much! I made this today. All I can honestly say about it is…. YUM! IT’S SO GOOD! Going to make some changes next time. I had bacon to put on top and cheese, but it was so good the way it was, I didn’t need anything else. Making a bigger batch tomorrow possibly adding some broccoli, cauliflower, carrots and onion. This dish will NOT disappoint you. It’s even good cold! I understand the idea behind calling this “crack” chicken is that it’s so delicious it’s addictive, but is there a better word you could use to describe this dish? So many families and communities have suffered and many lives have been lost to people using and selling crack. Just something to think about. Hi Brittany, I completely understand and sympathize. I’m actually not the one that came up with the name. Like virtually any other dish, I simply call it by its most common name, so that people can find it easily. Ten minutes of prep time?? I am totally sold! This chicken looks so incredible! LOVE crack chicken and LOVE this recipe!